Why did Turnbull dump the proposed GST increase? How did the "bedwetters'" and workers force a backdown on the GST by PM Turnbull? Former ATO Assistant Commissioner John Passant reviews the reasons and how we keep the GST off the table. IT WAS, of course, going to be the magic pudding for big business and the States and Territories — an extra $33 billion a year flowing into Commonwealth coffers as a result of increasing the GST from 10% to 15%. There was only one real problem —we punters were opposed to it. So opposed in fact that the popular Turnbull government might if it went to an election with the proposal lose what appears so far to be the unloseable election later this year. One poll for example showed support for the ALP increasing 2.5% and that for the Coalition falling 2.5% on a two party preferred basis when the GST chatter became a roar in the last few weeks. It would still not, yet, be enough for Labor to win but they were edging a hell of a lot closer than Turnbull, and some very worried Government backbenchers, would want. All that GST pain for no electoral gain, or even electoral loss saw Turnbull effectively dump a GST increase from 10% to 15% during the week. At first, this may seem surprising. Surely if anyone could sell a regressive tax increase it would be silver-tongued Malcolm. The fact he knew he couldn’t and that any proposed GST increase might make Bill Shorten Australia’s next Prime Minister shows the depth of basic class response workers have. They knew in their hearts that the GST increase was about slugging the poor and workers to benefit the rich and capital. The Business Council for example wanted the extra revenue from the GST to fund, among other things, a company tax cut of 5%. Not even Turnbull was able to figure out a way to cover up this GST gift to the rich and powerful. You can put lipstick on a pig but most of us are not going to buy it. It was our basic class gut instincts that stopped Malcolm Turnbull bringing home the GST bacon for his class. State governments, both Labor and Liberal, saw the proposed GST increase as a way of addressing chronic underfunding of health and education. The working class was to fund its own social welfare benefits even more. Rather than mobilising working class forces to fight for taxing the rich, Labor Premier Jay Wetherill opted for taxing the poor and working class. Social welfare is under constant attack from both government versions of neoliberalism. Tightening eligibility is one way governments address increases in spending on items like pensions and this conservative government has been no different. So any compensation, apart from the possibility of erosion in its value over time, will also increase the pressure on governments to cut eligibility, as they have been doing. Just on the pension, and as an aside, I remain in favour of a universal pension of say $30,000 a year for everyone over 65, the age limit reducing over time to 60. Scrapping the superannuation tax concessions worth an estimated $44 billion – more than we will spend on the pension – could help fund that. So, too, could taxing the rich through progressive income tax, wealth tax and estate duties, for example. Turnbull may have a small window of opportunity after the May Budget to call a double dissolution election and rid himself of some of those troublesome Senate cross benchers. 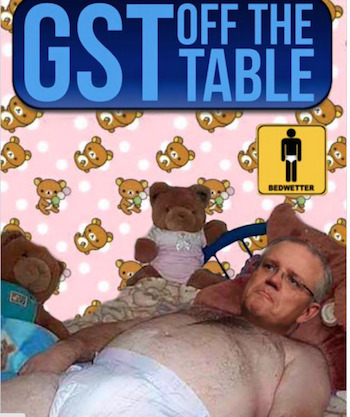 Abandoning the GST increase clears the decks of possible impediments to successfully prosecuting his re-election case after the Budget is handed down but before the hidden and not so hidden nasties bite. It is likely that Turnbull and Dutton will escalate even further the brutalising of refugees and the rhetoric against them to divert attention away from the brutality it wants to unleash on the poor and workers for the benefit of capital and the rich. None of this should be surprising. The decades of neoliberalism both globally and in Australia have basically been about shifting wealth from labour to capital to address falling profit rates. With the mining boom ended in Australia, the pressure is now on our leaders to do the same in a more sustained way. Turnbull will try to do that without risking losing the next election. As the master snake-oil salesman he may be able to get away with this for some time, especially if he gets rid of the more obvious policies that make this approach too obvious, such as the GST increase. The government will in the Budget fiddle at the edges and introduce some tax changes. They will most likely make some changes to the superannuation concessions (where the top ten per cent of income earners get 37% of the benefits), and to negative gearing, where rental losses are offset against other income. At this stage, it looks like they won’t touch the capital gains discount, where if you hold an asset for more than a year only half the capital gain is taxed. I merely note that the top 20% make 80% of the capital gains in Australia. But the other focus of this government appears now to be work related expenses. Not multinationals, not the 38% of big business pay no income tax, or the many more who pay little tax, but workers who claim deductions for expenses incurred in doing their job. These expenses, depending on your work, include the costs of clothing, laundry, travel between two workplaces, home office expenses, self-education, money spent on tools, and other work related costs. Good to see this government’s priorities are taxing workers, not tax avoiders. It was the basic gut reaction of workers against the unfair GST increases that forced Turnbull to quash any more talk on doing that. Let’s build on that to reject any new attempts by him to increase taxes on workers or to cut public services and social welfare to fund a company tax cut for the big end of town. This story was originally published on John Passant's website en Passant on 11 February 2016 and has been republished with permission.